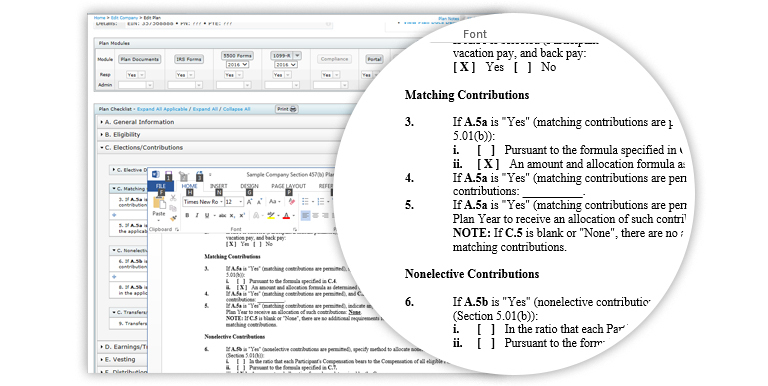 The Non-Qualified Plan Document package from ftwilliam.com provides both a 457(b) and 409A plan document. Both documents are generated in an Adoption Agreement and Basic Plan Document. The 457(b) document may be used by either a governmental or a tax-exempt entity. A tax-exempt entity can use the document to establish a top-hat plan. A governmental entity can use the document to establish a plan for their rank and file employees. The 409A document is a defined contribution plan that may be used to establish both an excess benefit and a top-hat plan for a select group of management or highly compensated employees. The Non-Qualified Plan Documents package from ftwilliam.com combines powerful technology, in-house attorney-written documents, and world class customer support to provide you with a first class document generation solution. Easy-to-use forms and amendments. Most of the forms and amendments can easily be generated using either the Batch Print or Group Print features. The Batch Print feature permits you to print amendments for all of your clients in a few easy steps. Streamlined data import and export. The exclusive ftwLink feature provides a .xml based interface for interfacing with your plan information. Using ftwLink you can add and edit plan information, extract checklist answers, and generate plan documents using a single, easy-to-use .xml interface. Extensive online error correction. While we cannot guarantee that each combination of checklist responses will result in the plan that meets the qualification requirements of the Internal Revenue Code and ERISA, our on-line error correction will identify all required responses and will highlight most conflicting responses. Streamlined data entry. When entering data, items for which no entry is required will appear shaded and will not allow data entry. For example, if a Rabbi trust will not be set up, all checklist questions related to a Rabbi trust will be shaded. The information for a shaded item will be maintained on the system but not used to generate a checklist or document. Custom language. Since the documents are delivered in .rtf format, you may perform extensive customization of each document. Unlimited checklist templates. Using the “Clone Me” feature, you may establish an unlimited number of custom default checklists. For example, you could establish a default checklist for a 457(b) Plan for one market segment and a different checklist for a 457(b) Plan for another market segment. Our Non-Qualified Plan Documents are available both via subscription and per-plan pricing options. Discuss with your ftwilliam.com sales consultant which might be the best option for you.